NavQuest is changing the way boaters plan their trips by making it as simple as point and click. Boaters have long been jealous of online mapping tools that make it simple for drivers to get from point A to point B, especially Ken Litvack, a school supply manufacturer who started boating 12 years ago. Litvack found the trip planning process arduous and wanted his friend Harry Sangha, who ran a tech and outsourcing consulting company, to help him develop a better system. Sangha, however, was busy with other projects and brushed him off. But when Litvack missed Sangha's wedding in 2002 because his boat hit a rock off Long Island Sound due to an error planning the complex trip by hand, the business idea started looking more promising. In 2003, with about $200,000 in funding from Litvack and some friends, the two started NavQuest and soon found themselves at an impasse: Maptech was the only company publishing electronic nautical charts, which needed to be viewed with proprietary software. It wasn't until 2005 that the software and charts were available for free to the public, allowing Sangha and his developers to improve the charts and make them more accessible to users. 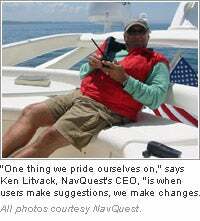 When NavQuest's beta site launched later that year, it wasn't as user-friendly as the founders had hoped. They started over, redesigned the entire site and launched the new NavQuest.com in February 2007. The site helps boaters with all types of crafts--from canoes to yachts--plan trips throughout the U.S. and its outlying territories by providing a paper or electronic trip ticket, similar to AAA's TripTik, that you can sync with a boat's navigation and weather equipment. "It provides many amenities. It's not just something to replace GPS," says Gaspare Marturano, NavQuest's vice president of sales and marketing, who joined the company a year after its founding. NavQuest provides location-based services, listings and entertainment opportunities at every point on a boater's journey. "We're the only people who give you what the weather condition is going to be for each turn," says Sangha. NavQuest also helps plan when and where you should refuel, stop for the night and grab a bite to eat along the way. Since its redesign, the site has had more than 5 million hits and 200,000 unique visitors, and it's poised to bring in $50,000 this year and $1.5 million next year in ad revenue. The company has two sales reps who sell banner, radio and video ads as well as listings in their marine and scuba yellow pages. The site also features boating products in an Amazon.com affiliate store. It's been a big year for NavQuest: The founders obtained a patent for their new technology in April, and the company recently earned top honors in the VC competition Pitching Across America, where they were voted top emerging U.S. company by more than 100 VCs and angel investors. Sangha and Litvack are now seeking VC funding to expand the site. NavQuest is set to go global once it fully covers the U.S. The founders have applied for patents in Canada, Europe and Japan, and plan to enter those markets in 2009. They also plan to license their navigation system to be used in portable wireless devices. For now, they're working on building their user base in the segmented boating market. "Sailors are a different breed of people from power boaters," says Marturano, a novice boater. "Their attitudes and the way they accept information are very different." Taking this into account, the team has a diversified marketing strategy that includes partnerships with boating, fishing and scuba sites, establishing a presence on blogs, MySpace and YouTube, and making appearances at boating shows. As the first mover in its market, NavQuest's biggest challenge is changing how boaters use technology. Says Sangha, "The tipping point is when they stop using one type of technology and move on to the next generation."